Vacancies declined at U.S. malls and held steady at strip shopping centers in the third quarter as landlords attracted new retailers to fill space as stalwarts such as Best Buy Co., Staples Inc., Gap Inc. and Office Depot Inc. closed stores or shifted to smaller ones. Malls in the top 77 U.S. markets posted an average vacancy rate of 8.7% in the quarter, down from 8.9% in the second quarter, according to new data from real-estate research company Reis Inc. The latest figure is a notable step down from the recent high of 9.4% set in last year’s third quarter. Mall rents, meanwhile, continued their slow rise, climbing 0.3% in the third quarter from the previous quarter to an average of $39.24 a square foot per year, according to Reis. The increase marked the fifth consecutive quarterly increase for malls, a group that includes large, enclosed shopping centers typically anchored by department stores. Retail strip centers, which are smaller than malls and feature several stores facing a common parking lot, typically with a grocery store as an anchor, didn’t fare quite as well. Their vacancy averaged 10.8% in the third quarter, unchanged from the previous one, Reis said. That rate is only slightly less than the recent high of 11% in last year’s fourth quarter as well as the 32-year high of 11.1% in 1990. Rents at retail strips increased by 0.1% to $16.57 per square foot per year, marking the third consecutive quarter of razor-thin increases in that sector. Shopping centers have struggled to rebound from the economic downturn, while facing competition from Internet rivals as well as a huge overhang of new development from the boom years. Rental rates for most shopping centers remain far below levels seen during the boom, a sign of the upheaval from the closing of big-name retailers. But landlords have been helped by a dearth of new retail space in the U.S. Also, while some chains are contracting, others are expanding. Space is being filled by stores such as TJX Cos. Inc.’s TJ Maxx and Marshalls, Nordstrom Inc.’s Nordstrom Rackand Lululemon Athletica Inc.
Beauty store Ulta Salon, Cosmetics & Fragrance Inc., which now operates 489 stores, intends to open 100 in its fiscal 2012. At the Santana Row shopping center in San Jose, Calif., Swedish fashion retailer Hennes & Mauritz AB opened a 28,000-square-foot store during the third quarter in a formers Borders Group Inc. space. Other new arrivals include fashion and accessories seller Kate Spade New York, New Zealand’s wool-clothing seller Icebreaker and an outpost of the Veggie Grill restaurant chain. Meanwhile, British luxury retailer Burberry vacated its 5,000-square-foot store there. 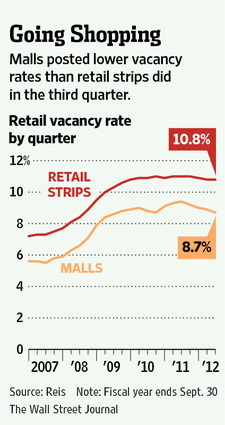 Some malls are filling vacancies with tenants other than stores. Greg Maloney, president and CEO of brokerage Jones Lang LaSalle’s Americas retail division, said the Bel Air Mall in Mobile, Ala., signed United Healthcare Services Inc. last quarter into a 1,200-square-foot former store, where the company is showcasing its services. Similarly, Myrtle Beach Mall in Myrtle Beach, S.C., recently signed local game show “Sqrambled Scuares” to film in a 3,700-square-foot former jewelry store. Even big-box centers, home to many retail chains hardest hit by online sales, are showing signs of a rebound. Big-box centers in the top 54 U.S. markets posted an average vacancy of 6.4% in the third quarter, unchanged from the second quarter and well removed from the measure’s recent high of 7.9% in 2009, according to the CoStar Group, which collects and analyzes commercial real-estate and economic data. Big-box lease rates, however, averaged $17.27 a square foot per year, far less than the recent high of $21.48 hit in 2007. “To me, it suggests that this (big-box) sector is doing OK, but not great,” said Suzanne Mulvee, CoStar’s director of retail research.